So I’ve got this pile of batteries, and I’d like to carry them around wherever we travel to. In a previous post I touched about some of the design requirements, and those ultimately go back to staying safe, and making things usable. This post is about the process of putting together some sticks of metal into a shape, to carry batteries, that I decided was optimal for my needs. If you copy this, your success may vary – as with all things in life. As much as I’d love to just duct tape some batteries in and be done, it’s just not going to happen with something this scale. The following statistics gave me pause for thought. It’s a lithium battery with special charge and discharge requirements of which affect the first 5 items. However, consider that gasoline in your car – it’s nearly 100 times the energy density of these batteries. Not to mention the 100 gallons of diesel that the bus carries, or the 28 gallons of propane that it carries as well. Or the kinetic energy you have when driving down the highway at 60 mph. Now, to read this at face value makes one think that it’s best to stick to walking. But, energy management enclosures happen all the time, one just needs to consider key factors when designing it. I need to build something that I can handle and carry myself into the vehicle, and that I’m capable of building. I can’t really replicate Nissan’s battery box myself, so I will stick to the materials I am familiar with – steel channel and framework. 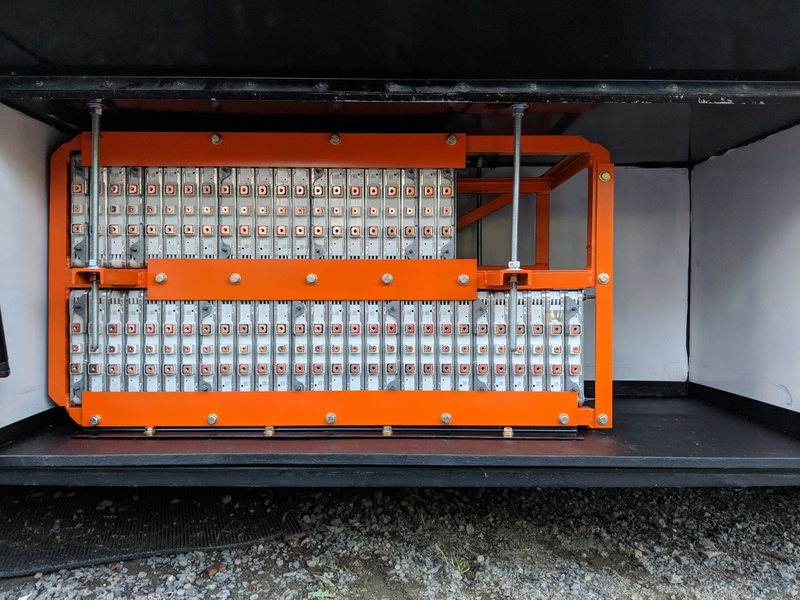 The frame + batteries will be too heavy to simply place inside the bay of the vehicle, so it will need to be suspended from the chassis or body. 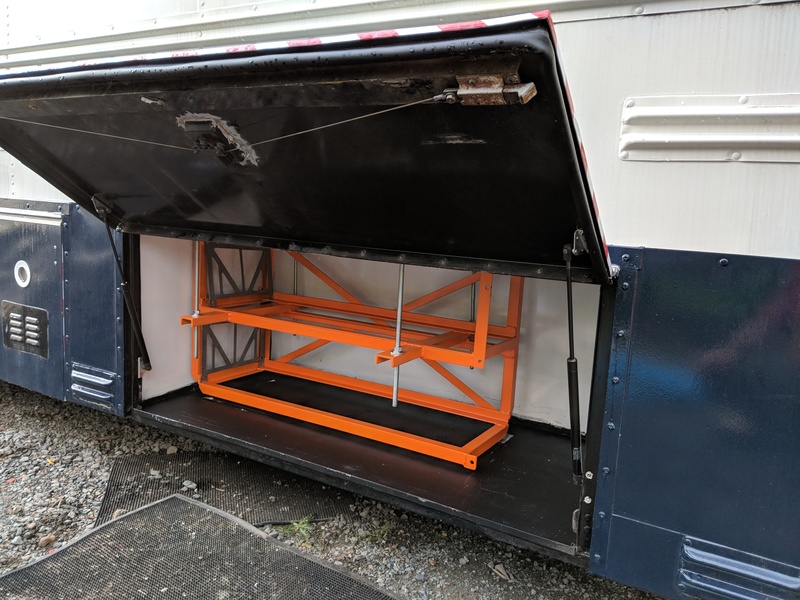 I initially considered hanging in between the frame rails, but fairly early on I decided that for ease of access, and for keeping this separate from all the other stuff under there like water tanks and other equipment, I’d use the equipment locker that usually holds jacks, tire chains, and other things. 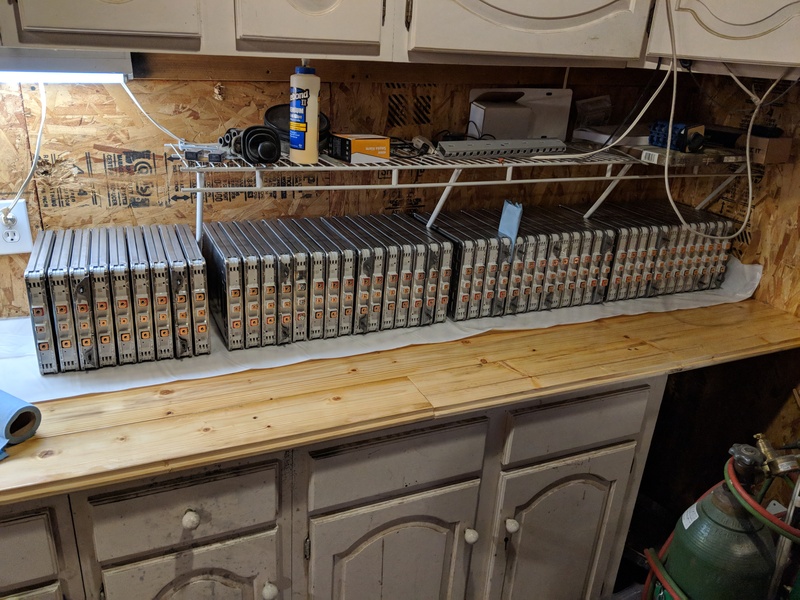 Since this locker is isolated from the other storage areas, it may work out well to add a fire suppression kit to it, I’m thinking of the Blazecut-T, which uses a clean agent called HFC-227EA, rated for live electrical equipment. Those road items can be stored in the main bay now, since we’re not hauling around a bunch of kid stuff anymore. 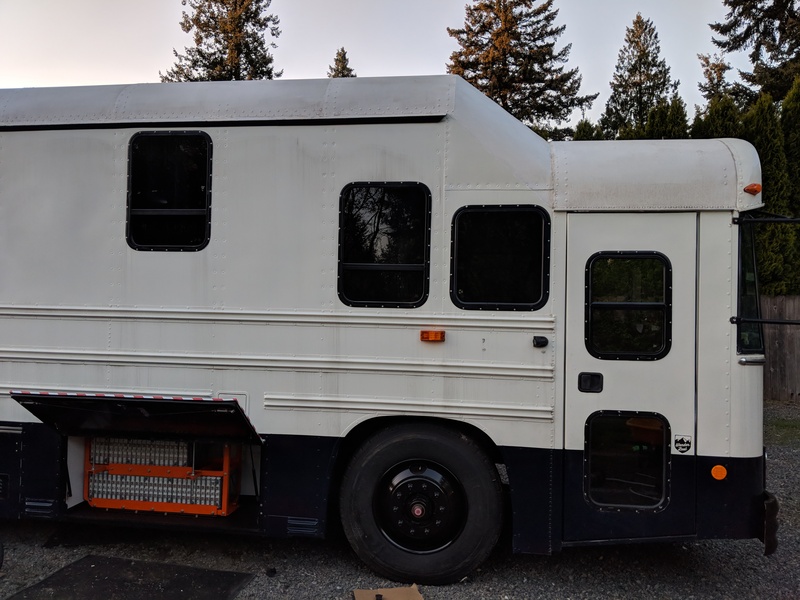 Now that I knew what I was dealing with for space and size considerations, I could determine what structure was available for hanging off the bus to bear the majority of the weight. It turns out that in that specific zone, there are two special “C” shaped riveted together pieces of transverse framework there. I rummaged around in school bus federal design and build standards, and I think they’re placed for transferring side impact away from the fuel tank. Conveniently, I used those same channels on the drivers side to hang the propane tank. 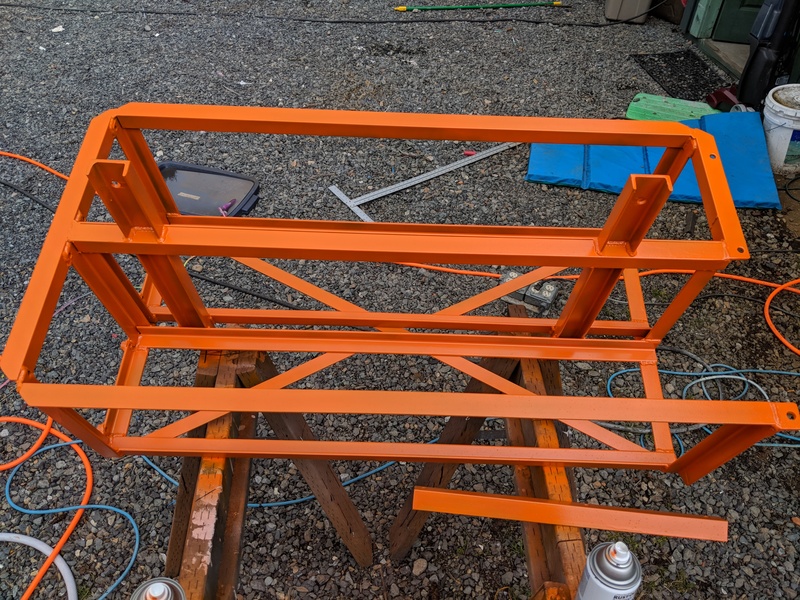 For this build, we will use that same heavy steel work to hang the battery. 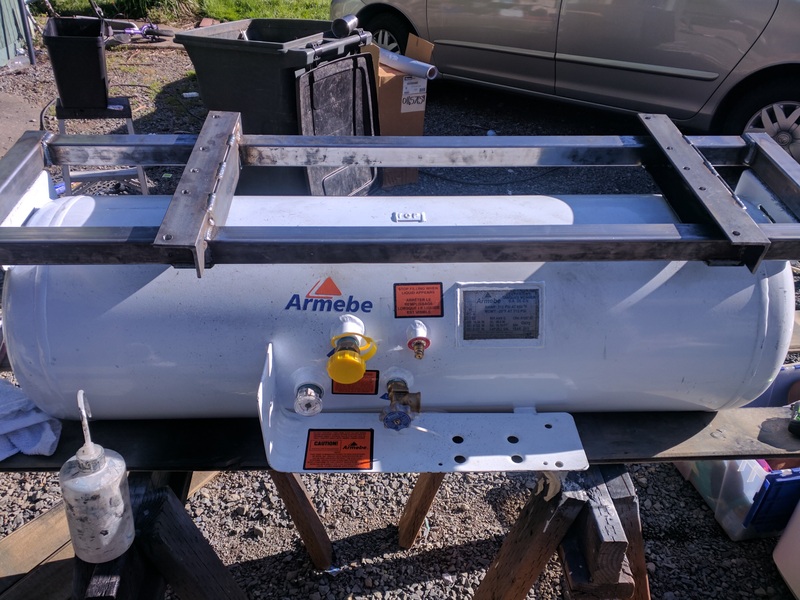 This is also good from a weight distribution standpoint – the propane tank assembly (tank, full fuel load, and support bracket) weighs about 300 lbs, so it’s not perfect, but it’s a good shift towards centerline weight again. This also means I’m basically fully loaded for weight on the front axle. I’m not over, but with a 13,500 lb steer axle weight, I’m sitting at about 11,500 on the front axle now. This is enough for me. The design of the enclosure is basically a big steel cube, with an upper and lower deck. 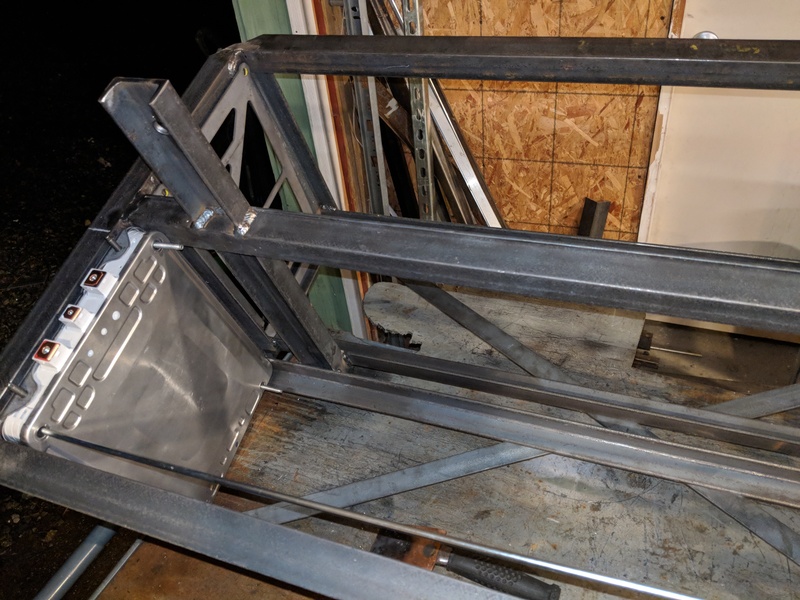 The thought is that the threaded rod (1/2″) hangs through the frame rails, and supports the majority of the weight from the frame, and lateral movement is taken up and controlled by the cargo box itself, which is connected to the frame of the vehicle, and hangs off the side skin of the body. Design and construction was pretty straightforward. 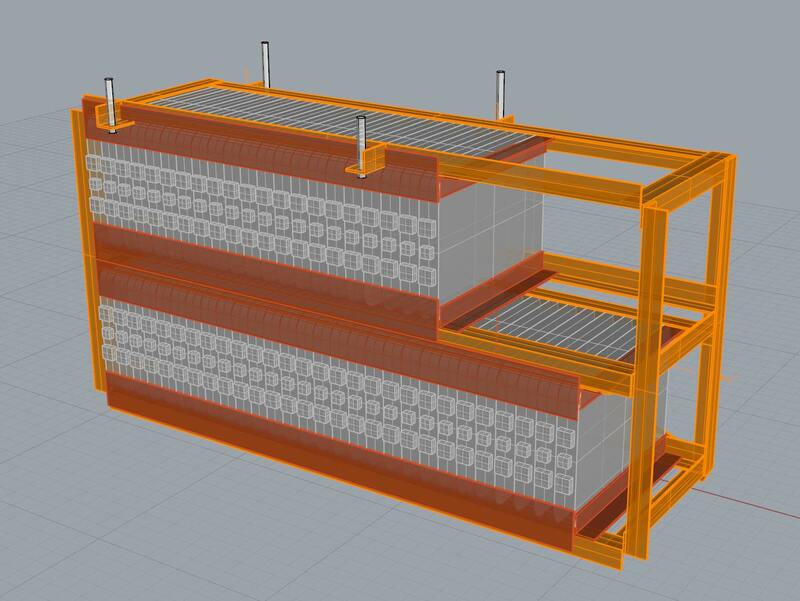 I made a 3d model of the battery and assembled them in the logical electrical topology I want, which is groups of 7, to fit in a 40″ space. I think I got a little optimistic on the module packing if you look at the model vs. the actual constructed item, but it was accounted for as I kept the check/build process going. During the design phase, one of my concerns is the placement of the battery terminals in relation to the holdback plates. I didn’t want to get too close to the copper bus bars that will get bolted to these terminals. I also noticed that some of these batteries have an integral threaded post/metal bracket thing, so I had to account that would be the critical tolerance for the holdback plates. Welding the framework together went relatively quickly, I found myself doing a lot of checking for squareness on this assembly. It would be easy to clamp and weld, and things twist out of shape slightly during heating and cooling of the welds. Once it’s all put together the strength is in the overlapping flange welds on all the angle iron. Something that changed during the actual construction is placement of the hangar supports. Instead of locating at the top edge, I opted for a middle placement. It seemed to make more sense to put half the “battery basket” in compression and half in tension for carrying the load. It also adds a hardpoint to install a crashbar on the outside of the case. I haven’t built that yet but I’m considering it. 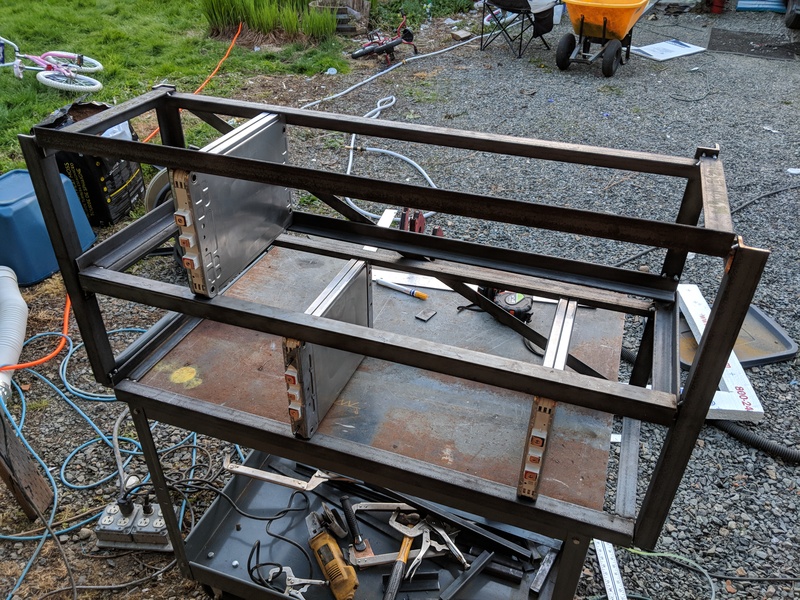 Once I finished the final welding of the framework, I drilled a bunch of holes for the battery compression rods, and fitted some of the old hold down clamps from the leaf battery for re-use. Then it was the standard dress, clean, scuff, clean some more, then prime and paint. I like the orange color. It sort of reminded me of home depot, but it is also a nice “warning, maybe this is something you should pay attention to” color. Mostly I like the contrast of blue bus with orange box. One of the design decisions was to simply install the frame inside the bus, and not treat it as a “removable” module. 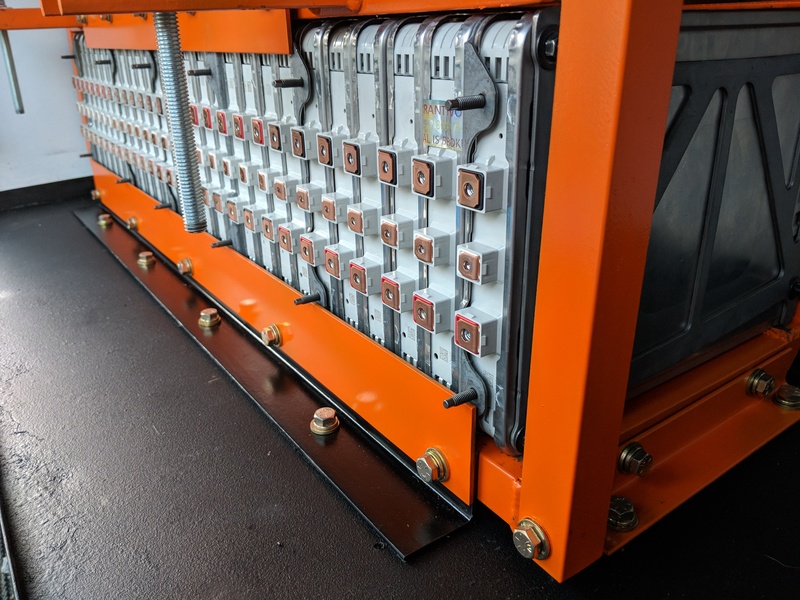 If you want to take the pack out, it’s going to basically be a process of removing all the bus bars, then carting all the cells out one at a time, then you can unbolt the frame hanger rods and finally pull the frame out. It seemed like making it cool and modular was designing for something that wouldn’t happen very often. It’s pretty accessible so any maintenance to the battery should be able to happen right there in the equipment bay. After getting the framework bolted and some of the access holes for the hangar rod sealed to keep the weather out, I began loading the modules in. My daughter helped carry them one at a time, and I shoved them into the framework, like a giant encyclopedia set of electrons. It was satisfying. Next up was the attachment plates to the cargo box. This keeps the pack from lateral and fore-aft movement. Any inertia will be taken up from the box. 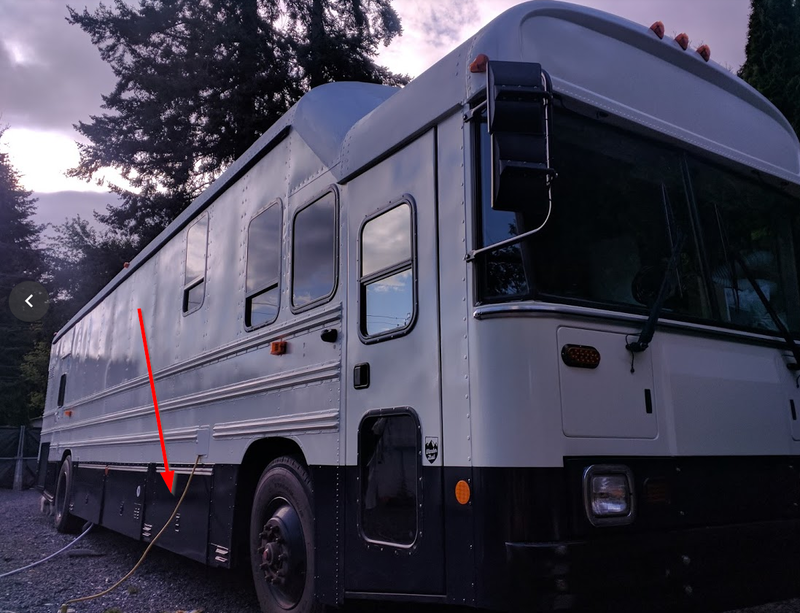 In the case of a high energy movement like a crash, I tried to keep the threaded rod away from the bus bars as much as possible, and I expect the rod to deform around the edge of the framework up top. Hopefully, it just won’t move much since the rest of the vehicle is nearly 30,000 lbs. There’s about 10 inches of setback from the surface of the batteries to the outside of the door. In the event of a high-center or crush from below, the steel rods should bow out, with about 8-10 inches of crush space for the box to ride upwards. 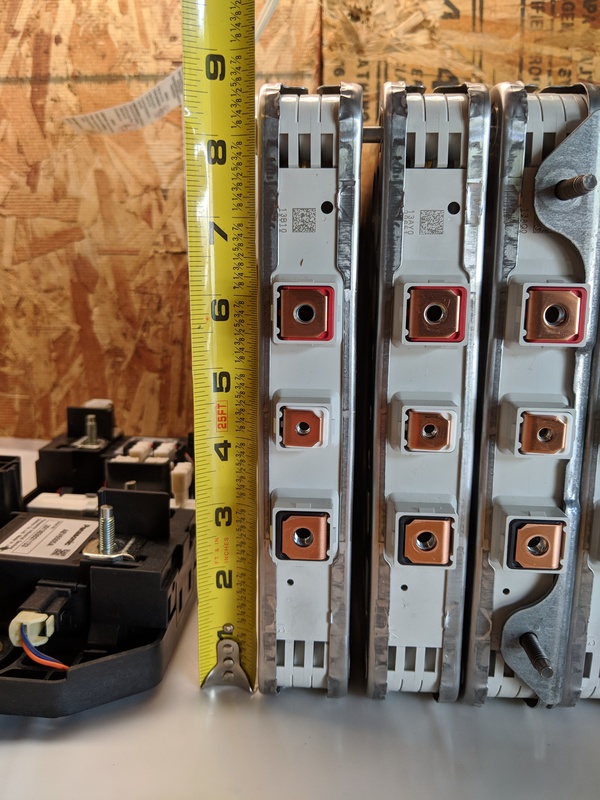 Finally, I bolted on the remainder of the holdback plates, and now I’m beginning to think about the REC-BMS battery management system, getting some inlet and outlets for power and cooling, insulating the space, and adding a small heater for thermal control for cold days.